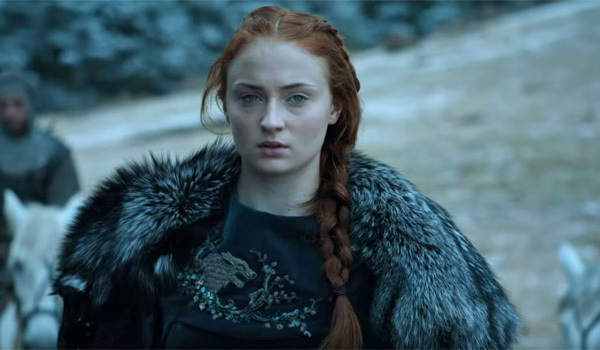 Is There Anything To That Depressing Game Of Thrones Sansa Theory? While Game of Thrones has made plenty of changes from George R.R. Martin’s A Song of Ice and Fire series, a lot of the overarching beats in both the show and the books have remained the same. Heading into Season 6, however, there’s no blueprint for fans of both mediums to hold onto. This means, of course, that wild theories about the rest of Season 6 have begun circulating on the internet. The latest has to do with Sansa’s short-lived marriage to Ramsay Bolton, which culminated in a scene where Sansa was brutally raped by her newfound husband while Theon Greyjoy watched. Many are now speculating that a baby may be coming out of that horrific moment. The news first washed up over the summer when some enterprising individuals nabbed some photos from the set that made Sansa look as if she may have had a baby bump. I don’t know if you’ve ever really paid attention to the clothing Sophie Turner has to wear while playing Sansa, but it’s extremely heavy and not particularly flattering. At the time, whether or not a baby bump was present was put aside as more pressing matters, such as whether or not Jon Snow was going to be a part of Season 6, became more public talking points. So, why are we bringing it up now? I can still feel it. I don't mean in my tender heart it still pains me so. I can still feel what he did in my body, standing here right now. It almost sounds as if she’s talking about a young life starting in her body rather than just the memory of what Ramsay did to her playing over and over again in her head. (I’m sure that would be happening, too.) An expanding waistline could also explain why she decided to make herself a new outfit during the episodes, although she also made Jon one, and he's certainly not pregnant. If she is pregnant, it would explain a lot, including why the showrunners built up Sansa’s confidence only to see her essentially treated like complete crap and then raped on the series, only to see her take control of her own life once more. We weren't happy when she was forced into subservience with Ramsay, but if a baby was the goal, it makes more sense. Of course, Sansa wouldn’t need a baby to take control of her own life and turn the tide in favor of the Starks. However, the whole thing is so horribly depressing, it does sound like a plot twist that George R.R. Martin would write and then impart on showrunners Dan Weiss and David Benioff. We already know the fantasy writer sat down with the two showrunners to plot out the major components of the rest of the series on Game of Thrones. We also know there may only be a couple of seasons of the hit HBO show left to air. Which means that any new twists that are introduced will need to be resolved sooner rather than later, and we're interested to see how this depressing Sansa theory pans out. For more that we know about the upcoming episodes, head here.